Disgruntled rail passengers face missing out on discounted fares due to difficulties purchasing a new railcard. The 26-30 Railcard went on general sale at noon on Wednesday but a number of people said they were unable to buy it despite waiting in an online queue for several hours. The national launch comes as rail fares rose by 3.1% sparking protests at stations. Some passengers were in a race against time to get hold of the so-called millennial railcard before using it to travel. Many rail passengers were waiting more than an hour to order their railcard. The railcard is only being sold online or over the phone. Mark Dryden wrote on Twitter: "What should I do about the queue if I have 26-30 tickets for a 14:33 train from Manchester Victoria to Newcastle? "Surely it should be easier and quicker to buy the railcard than this or at least be possible to buy them at the station?" In reply to another concerned passenger who asked if she would be able to claim a refund if she has to pay full price for a journey on Thursday, the Railcard Twitter account replied: "You need a valid railcard to receive the discount before travelling." Another Twitter user, Latisha, posted a message stating that she had been waiting for two hours, adding: "Surely the website is designed for the usual traffic you would expect." A spokeswoman for National Rail said: "We are experiencing high demand for the 26-30 Railcard, which is resulting in higher wait times than usual. "To ensure we give customers a great experience, we have put into place the same type of technology used by other businesses, such as Glastonbury, during high-profile launches. 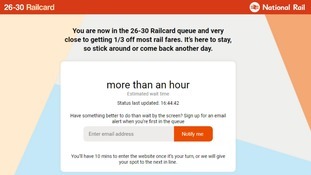 "When customers access the 26-30 Railcard website they are automatically put into a live queue and are able to sign up to receive email alerts so that they do not have to wait by their computer. "There isn’t a limited number of railcards being made available so anyone who isn’t planning to travel today can come back another day to make their 26-30 Railcard purchase." The 26-30 Railcard has faced a number of problems. The launch of a nationwide trial of 10,000 cards in March 2018 saw it selling out on the first day despite people facing website problems for several hours. Its roll out to general sale was initially due to take place before the end of last year, but this was pushed back to Wednesday. The delay meant people born on January 1 or 2 1988 were unable to purchase the card before becoming ineligible due to being too old. Cardholders save an average of £125 a year, according to industry body the Rail Delivery Group.